As part of my duties as facilitator, I had to use spray glue. Here's the truth: I do not enjoy using adhesives under aerosol pressure. Besides having to spray from the correct distance and with the nozzle pointing in the correct direction, I had to spray it outside in freezing temperatures because of the pungent fumes. Basically, I took a creative risk, especially with the glue. 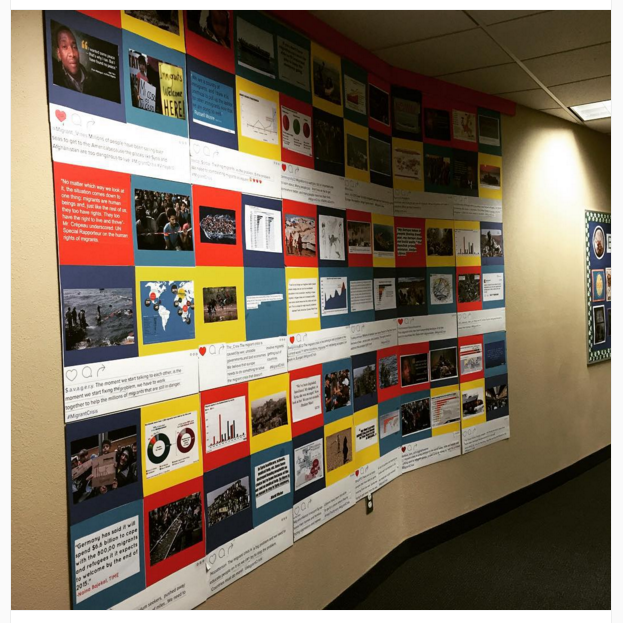 Another adhesive risk was taken by using velcro to put the Instagram posts on the wall. We think it'll hold. I'm basing this on a teacher's review of the particular velcro product I purchased. The teacher used it to build shelves, a reading corner, and basically her entire classroom. All held together by velcro. Certainly it can hold some cardboard and paper. We only need it to hold for a year. Your creative risks paid off... This looks amazing! Beautiful work. I'm v. inspired by it.